A globe-trotting TV career…and musical Armageddon! Alumni > News & Events > News > A globe-trotting TV career…and musical Armageddon! In a colourful life, triple BAFTA-nominated Martyn Day has enjoyed an illustrious television career that ranged from working on much-loved children’s programmes to making documentaries in locations as disparate as the Arctic and India. Martyn (OE 1956–1963) has socialised with the Rolling Stones’ Keith Richards. He has played at Glastonbury. And, in 1965, in one never-to-be-forgotten evening, his mod band supported The Who – then just on the brink of international stardom. Yet before all that, it was two teachers at QE who inspired this artistically inclined Leicester House pupil and helped set him on to his preferred path in life – although not everyone at the School was so supportive of his ambitions, as he recalls. “The QE that I went to was very different to the School today. Under Ernest Jenkins’s rather stuffy headship, the place was not geared up for us off-beat souls who did not want to become accountants, lawyers or colonial administrators. I was told that I was not suitable for university (i.e. Oxford or Cambridge) but ‘Not to worry!’ There was an ‘interesting future’ for me in: a) the City, b) the Armed Services or c) the Church. This was of little use as I wanted to work in TV. “Fortunately, there were two teachers who helped me out: ‘Jerry’ Reid, my English teacher, who introduced me to a world of literature way beyond the School curriculum, and Kaye Townsend, Maths, who heard my complaint and introduced me to a film production accountant. Maybe not lunch with Stanley Kubrick, but a welcome step in the right direction. 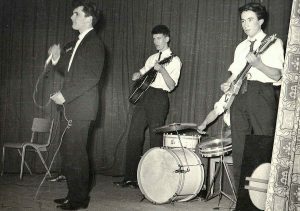 But the most memorable night of all came on 17th June 1965, when The Trekkas (pictured here at around the same date) had been booked to play support at Bowes Lyon House in Stevenage. “What we didn’t know was the name of the band we were supporting. All we knew was they came from West London. “We got there about 6.00pm to set up and were surprised to see that the other band – the unknown ‘stars’ – had already been into the hall, set up their own equipment and left. There was a drum kit and two huge amplifiers, bigger than anything that we had seen before. 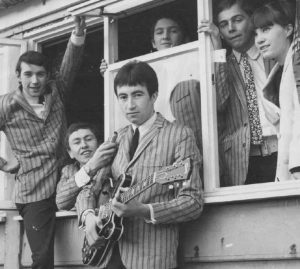 As a local band with many fans in the audience, Martyn and his bandmates were initially confident that “we’d blow them off the stage” – until the main act [The Who] actually walked on. “The guys coming on after us weren’t neat at all. There were four of them and they didn’t bother with matching outfits like most other bands at the time…One [Keith Moon] wore a t-shirt with an RAF roundel on the front. Another, the singer [Roger Daltrey], had an arrow point-striped shirt. The bass player [John Entwhistle] was wearing a jacket covered with military insignia. The guitar player [Pete Townshend], carrying a beaten-up Rickenbacker, had a jacket made from a Union Jack. “There was definitely something about them – a kind of ‘flash’ arrogance perhaps – but they were certainly cooler than us, sharper than us, angrier than us. In 1965 there was a word for people like them. They were ‘faces’ – out in front setting the trend. “They didn’t bother with any of that ‘Hello, Good Evening’ nonsense. They just plugged in their guitars, looked at each other and let rip. “They didn’t play their music, they attacked it. The volume was incredible. The bass line thudded against you, rattling your entrails. The drummer, RAF roundel man [Keith Moon], ignored most of the percussion niceties, and set out to beat his kit to death. On top of all this turmoil the guitarist in his Union Jack jacket [Pete Townshend] was chopping and hacking at his guitar, his arm windmilling in the air and slashing down to punch out chords. The photo here shows a gig Martyn played at Goffs Oak while still at QE. He is pictured with fellow Elizabethan colleague Guy Hewlett (1954-1962), backing Tommy Moeller. Moeller later became the lead singer with Unit 4 plus 2, who had a No. 1 hit with Concrete and Clay. Away from his music, Martyn’s television career was progressing well, as over the years he moved into special effects and then trained as a film editor, working in this era on the second and third series of Dr Who and, in 1973, as a researcher on the children’s TV magazine, Magpie. By 1982, Martyn was a producer at Granada TV, where he worked until the early 1990s, finishing his period there as a writer/producer/director. He spent two years in Macedonia producing a teen drama written to reduce ethnic tension to prevent the war in Kosovo spreading south (“It did – and it didn’t!”). He retired in 2010 after producing two series of the BAFTA-nominated game show, Jungle Run. Today Martyn, who lives in Twickenham, retains his keen interest in music, playing bass guitar in a band performing 1950s rock’n’roll. He writes a regular local history strand for the St Margarets Community Newsletter and St Margarets Magazine. He is also a warranted Cub Scout Leader. In October, he was among the OE guests who came to the School to pass on their expertise at the Year 11 Careers Convention.